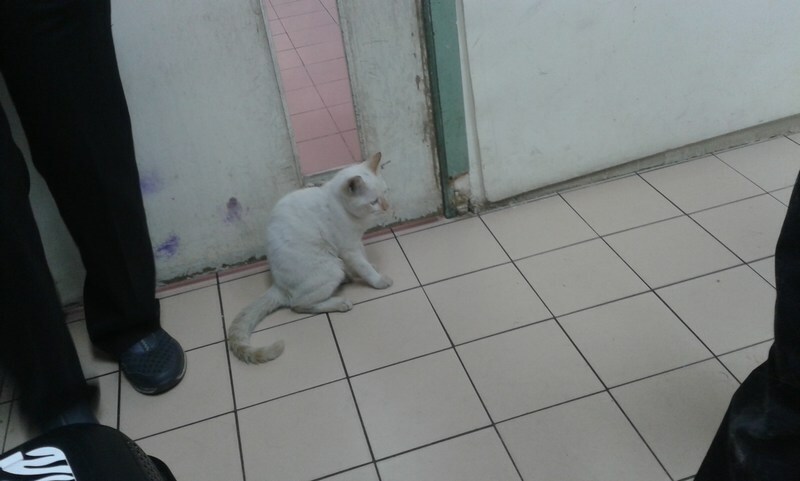 This morning, I was conducting a lab class in the computer lab when I had dismissed the class and while the students were leaving, a white cat sauntered into the computer lab! 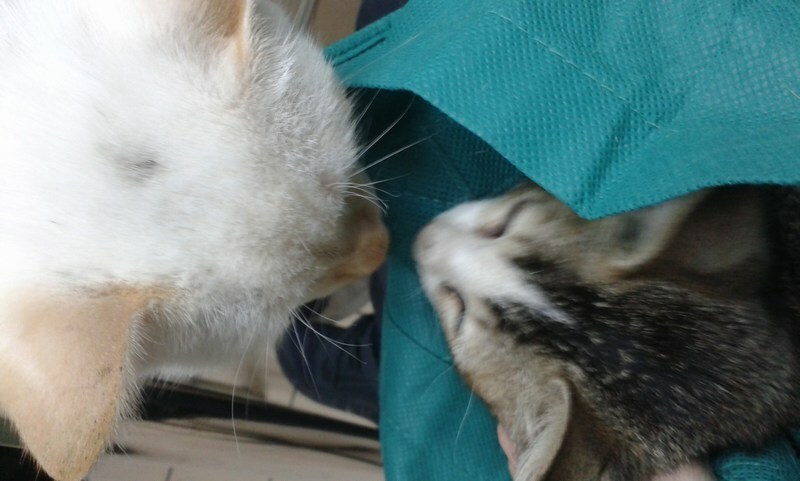 The students exclaimed and were quite delighted (as young people often are), but the college does not look kindly upon animals within its premises and already, the next lab instructor was asking the students to chase the cat out. 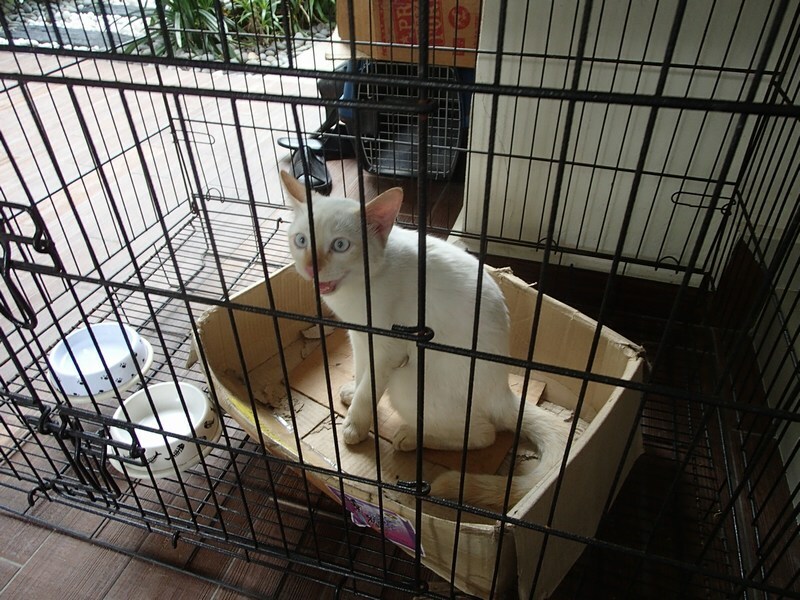 So I caught the cat, who was very friendly but a little scared, and took him to the canteen. 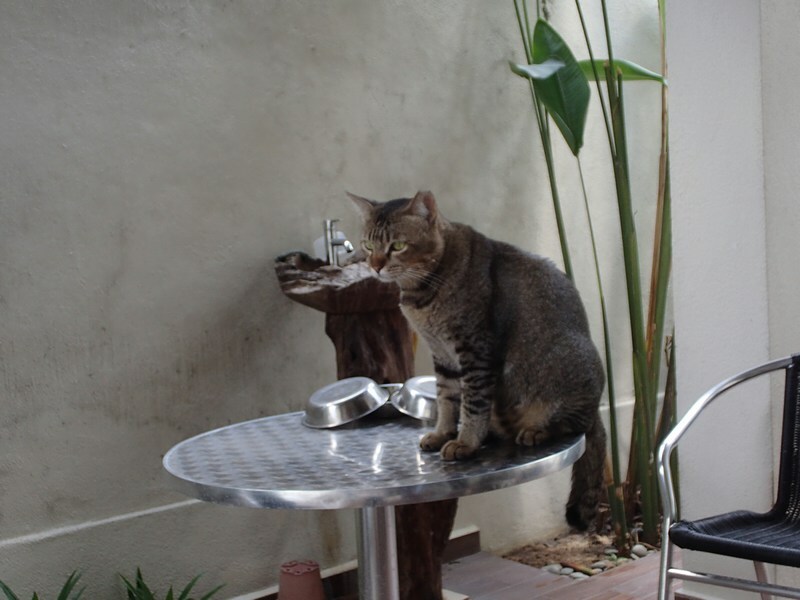 The Indonesians who operate the canteen also feed cats. However, the canteen operator was unwilling to even look after the cat for 2 hours until I finished my next class. Luckily two of my students were around, Ivan and Justin, and I asked if they would be able to keep an eye on the cat for two hours and I will take over the cat after class. Ivan and Justin agreed. Ivan texted to say the cat was sleeping comfortably and they were both keeping an eye on him. Connie soon arrived and collected the cat from Ivan and Justin. Thank you very much, boys! 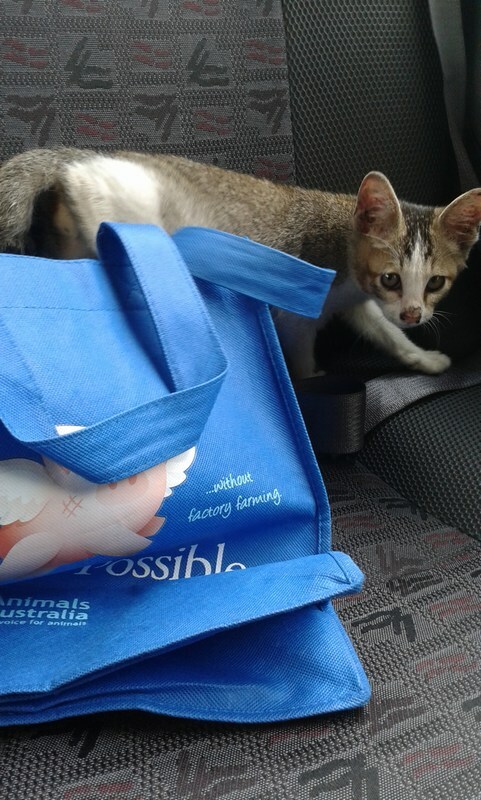 Here’s the friendly cat on the way to the clinic in Connie’s car. 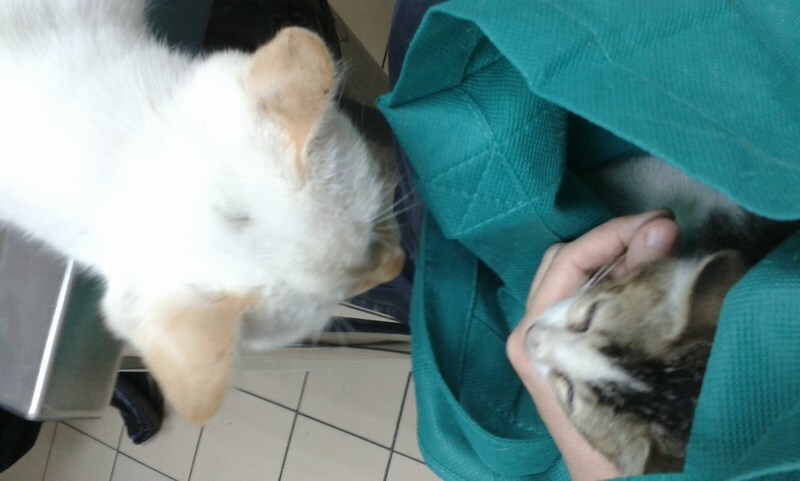 There clinic was exceptionally crowded and by the time I finished my next class, it still wasn’t the cat’s turn yet. 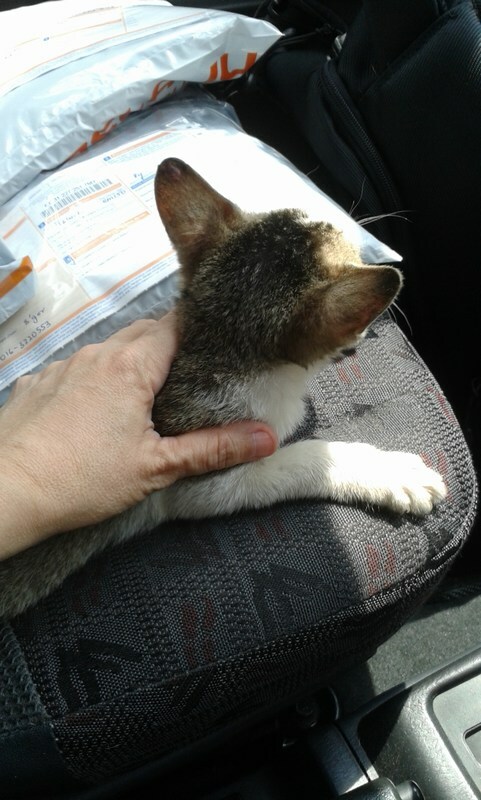 So I was about to head off to the clinic to meet Connie and cat when I approached my car and saw this tiny little kitten mewing and walking around aimlessly between the cars. Oh my gosh…he is so tiny and there are cars going in and out of this parking lot, he might just get run over. Another lecturer told me she’d seen this tiny kitten around for the past few days. Someone could have dumped the kitten there. I also know that the canteen operators feed a few cats and kittens around this area, but to expect them to look after a tiny kitten like this is impossible. Oh well, maybe today is a day of rescuing abandoned cats/kittens, I thought. So I scooped up the little thing (who did not even protest) and put him in my back seat. Let’s go the vet’s, I said. I had no carrier, so I put him into one of my shopping bags. Of course, he crawled out. And came to the front with me. We soon reached the clinic and Connie and I waited for at least another one-and-a-half hours before it was our turn to go in. 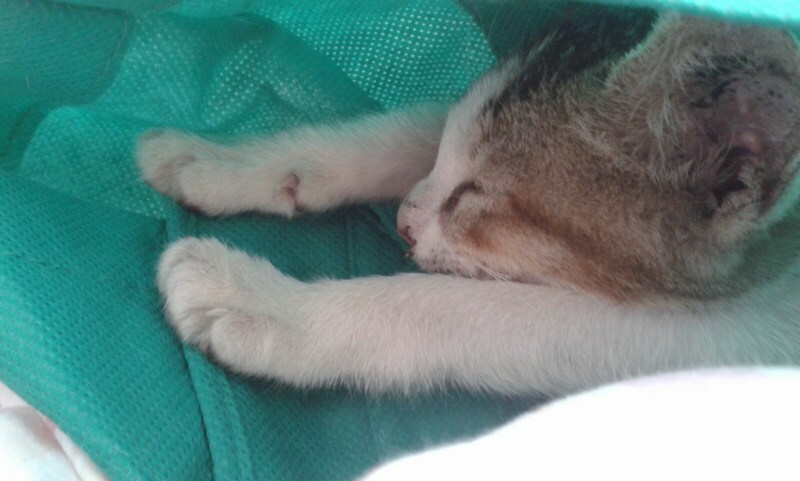 While we waited, the bigger cat was calm in the carrier. The little one slept in my arms. He’s bunny-coloured and he looks like Bosco. Sigh…I just cannot adopt another kitten anymore. I’m already looking after 14 now. So while we waited, I texted a friend to ask if she would like to adopt both of them. I sent their photos too. Today is really my lucky day! We’ll get the two checked by the vet and send them over later in the afternoon. 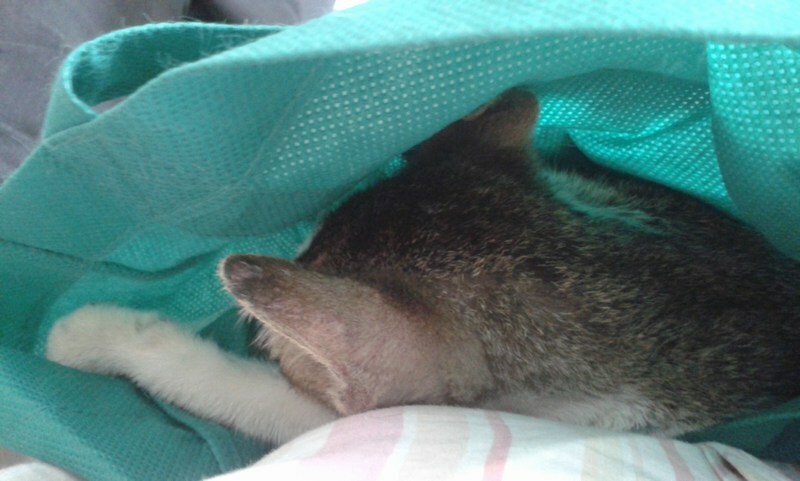 The little one hid inside the examination room. 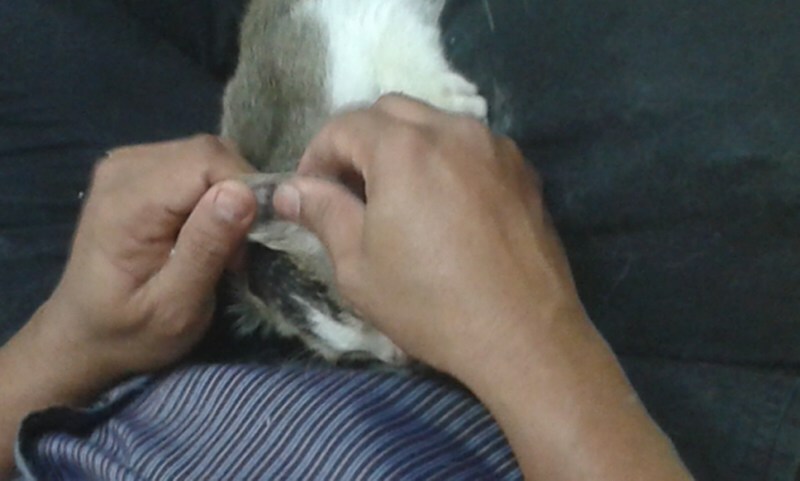 The vet cleaned his ears and checked inside. His inner ears are squeaky clean. His gums are pink and lovely and he is in good health, estimated to be not more than 2 1/2 months old, based on his teeth. However, his intestines has a lot of gas, so this needs to be watched. He was dewormed and hopefully this will help clear the gas. 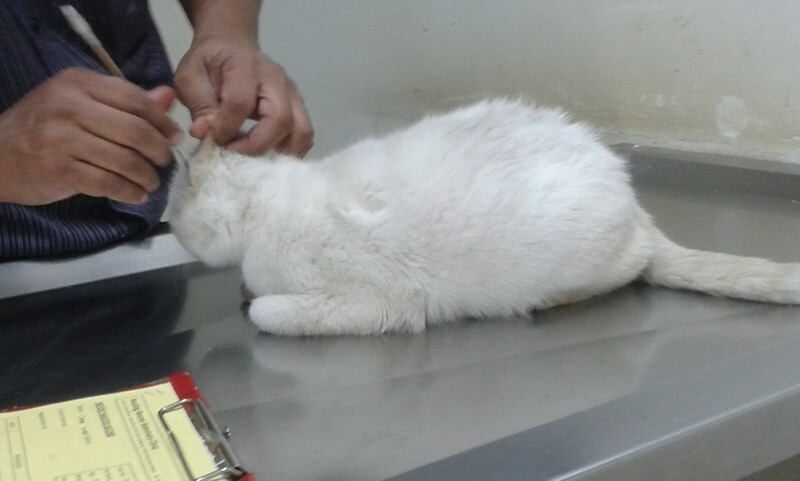 The vet examined him thoroughly and found three scabs – one on the elbow, one on the body and one beside the eye. All appears to be already healing and drying up. 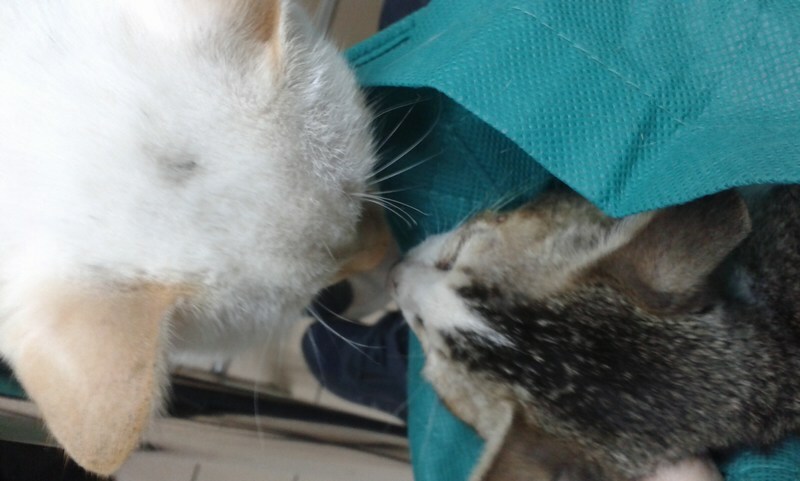 The vet thinks it could be due to territorial fighting, maybe being scratched by another cat. Povidone iodine was applied on the wounds. Nothing else needed to be done for this kitten. A diet of boiled chicken is recommended to start off and he should be on this diet for a few days. Next was the bigger cat. We had already decided his name would be Ivan. Ivan was super friendly and confident. His ears were wet, though. The vet did a check under the microscope and found no mites. 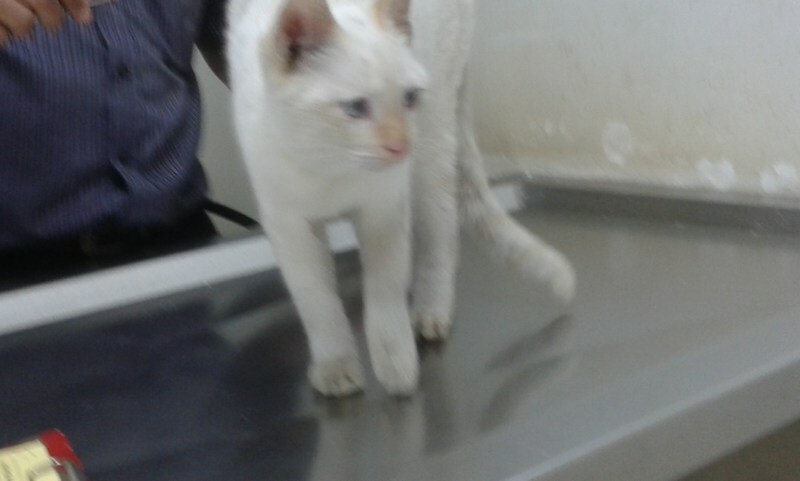 So both ears were cleaned and Ivan was dewormed too. Ivan is estimated to be about 5 months old, based on his size, but based on his teeth (he has no canines yet), he should only be 2 1/2 months! The vet said this didn’t quite make sense as he is so big…unless he has some mainecoon blood along the line! 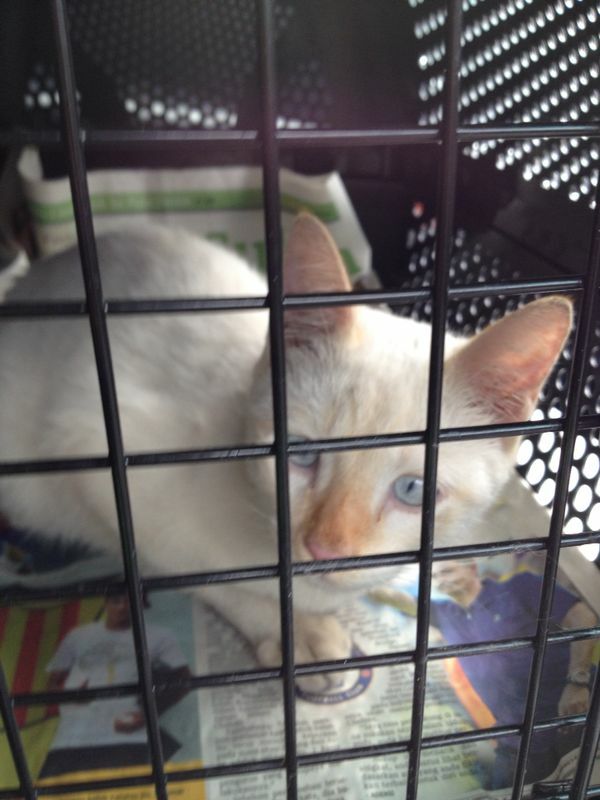 And he is also cross-eyed, which is a genetic defect, but it doesn’t matter. 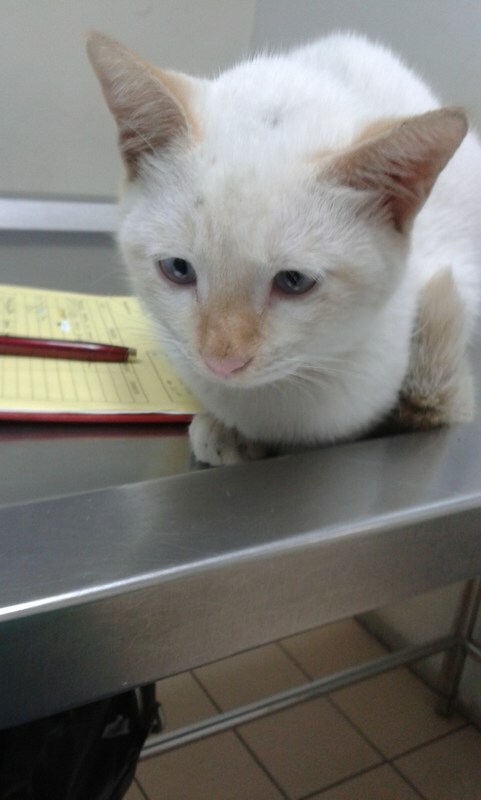 The vet quipped he is probably so happy because he sees everything as being funny (he’s cross-eyed!). See how friendly Ivan is? Ivan initiates friendship with Justin. Connie and I had to go pick up our Bacoff stock, so we brought both cats back to my house first. A feast of Monge chicken (boiled chicken)! All the PatioCats came to look. The PatioCats were curious but friendly. Mother and daughter kept a cautious distance. Both finished up one can – half a can each. Then we quickly went off to collect our Bacoff stock and returned. Ivan looked set to participate in another adventure. Baby Justin was sleeping inside the litter box. Ginger was sitting beside Justin’s cage, keeping him company. How good is Ginger, right? But…Ginger was limping, for some reason. We watched him and he was definitely limping on his left hind leg. 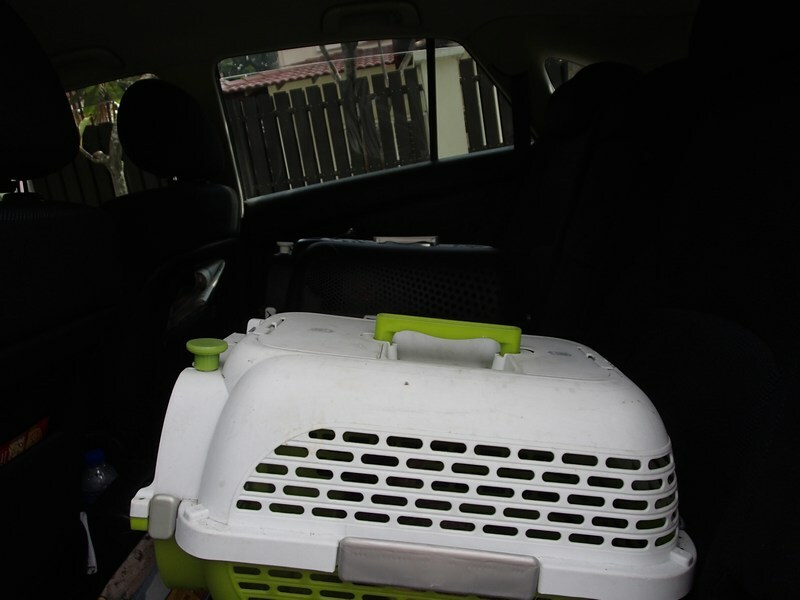 Oh dear….so Connie offered to fetch Ivan and Justin to their new home while I take Ginger to the vet for a check-up. We loaded Ivan and Justin into Connie’s car, with a box of Monge Chicken, and I bade them farewell. Then, I bundled up Ginger and we were on our way to the vet’s. Now, Ivan and Justin are safely in their new home already! Have a great life, Ivan and Justin. Thank you, Ivan and Justin (my human students), Connie and my friend who offered to adopt them. Rescued and adopted on the same day – I am truly lucky! What pretty cats they both are! And I think Ivan’s crossed eyes are adorable. I’m relieved both that they’re healthy and that they’re so quickly adopted. Wishing them a long, healthy and happy life in their new HOME. I love reading stories like these! Dr Tan, I hope your story inspires others to help animals. 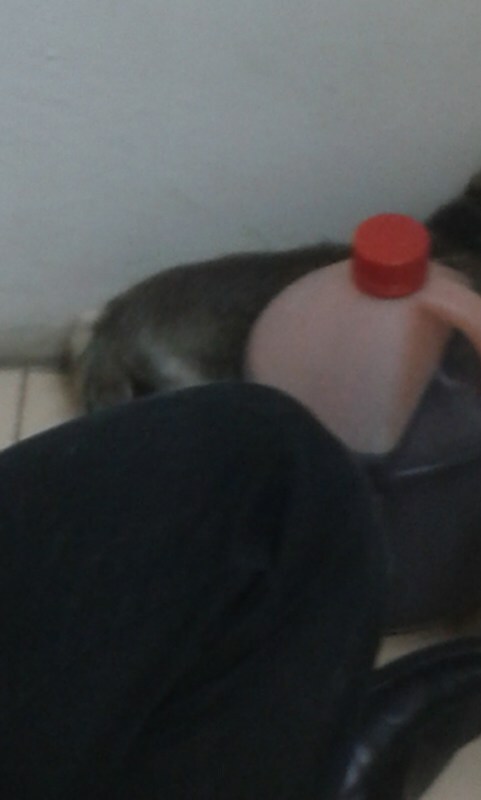 Similarly, this was how I found Simba. 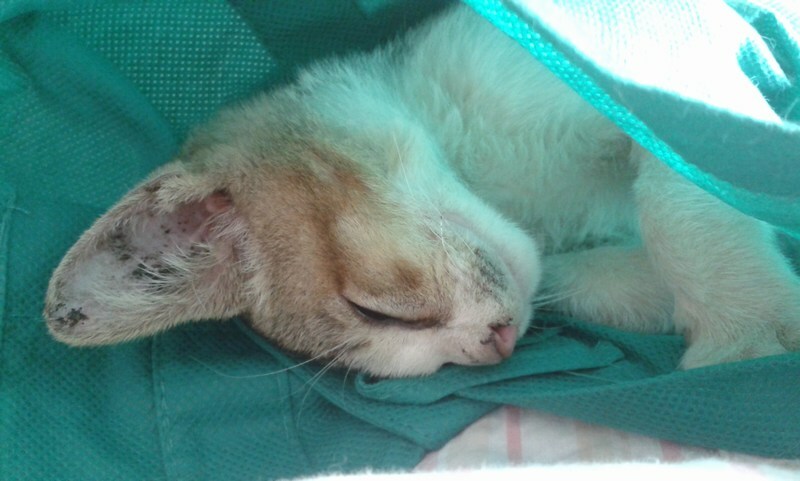 He was all alone at a busy road opposite the LRT station and I just thought there was no way I could leave him there.